Next Monday (04 November) members of the Communication Workers Union (CWU) will be on strike in Royal Mail across all grades. Amazingly, for the first time since 1979, the middle managers’ union, the CMA/part of Unite will also be taking strike action on the same day! There will also be strike action by CWU members across scores of Crown Post Offices including Swiss Cottage in Camden, which is threatened with privatisation in the new year. A rally will be held at the Queen Elizabeth II Conference Centre, SW1 near Parliament Square (nearest stations: St James Park, Westminster), from 12 noon. The CWU action in the wake of the flotation of Royal Mail on the Stock Exchange coincides with a two-hour strike by FBU members in defence of firefighters’ pensions on the Monday morning, which itself comes soon after an evening walk-out by the FBU this Friday. On Thursday of this week (31 October) UNISON members in Higher Education will be joining lecturers in the UCU and other support workers belonging to Unite in unprecedented cross-union action following the overwhelming rejection of an abysmal 1% pay offer by the university employers. Pickets are planned at 22 campus sites across London including Birkbeck College, the Institute of Education, the School of Oriental & African Studies, University College London and the Senate House building in Camden. 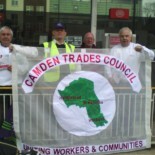 This entry was posted on October 29, 2013 by CAMDEN TRADES COUNCIL.